I'm new here so forgive me, but is this the appropriate area to post Jasta 5 photos? I have several to share but I want to make sure I'm in the proper area. You all have seen these photos, no doubt, but it's nice to look at them beyond the 2x2" sizes in many books (although when posting them here they are much smaller than the masters in my computer, but these are still an improvement). If I'm in the wrong area for this please direct me to the proper one. Boistrancourt 2004. Grass was not this vivid green when I took the photo; just the way it turned out on the film. Very interesting past/present photo! Now we can actually see the observation tower hidden at the left of the treeline. That was a substantial tower. 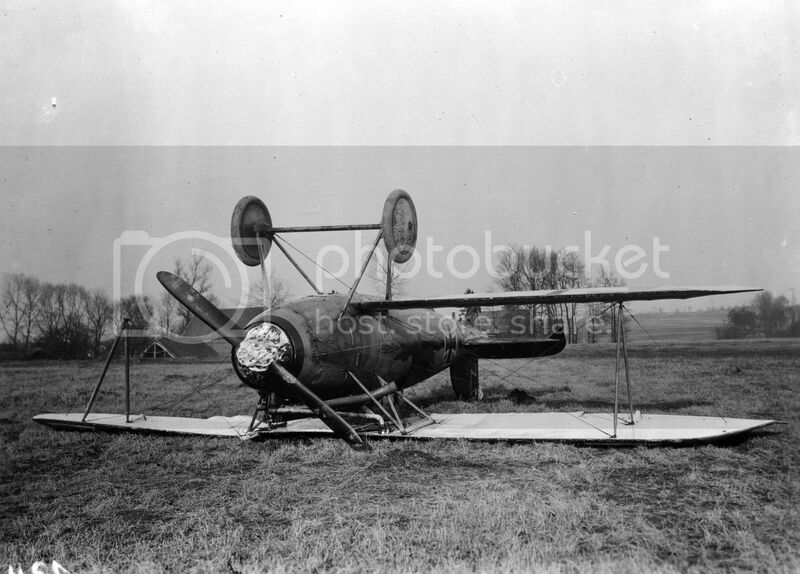 Sturm -- is that your plane sitting upside down? May I make a humble suggestion. 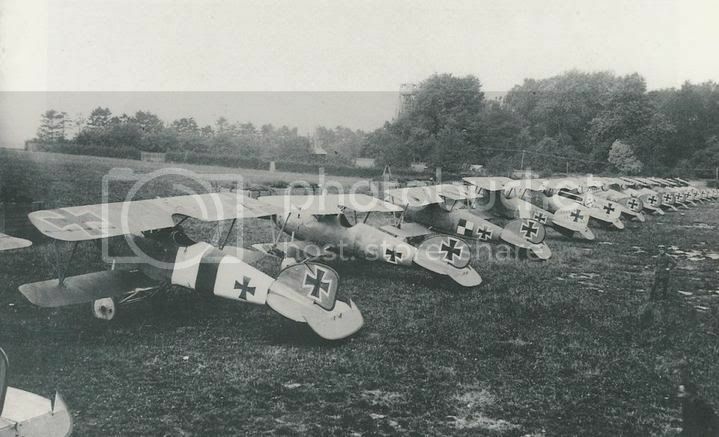 May we use this photo as our flight line photo on mumble, I believe the one there is of Jasta 11 or JG1 This is cool photo and it needs a home. Albatros D.Va 5639/17. One of von Hippel's many pranged machines. 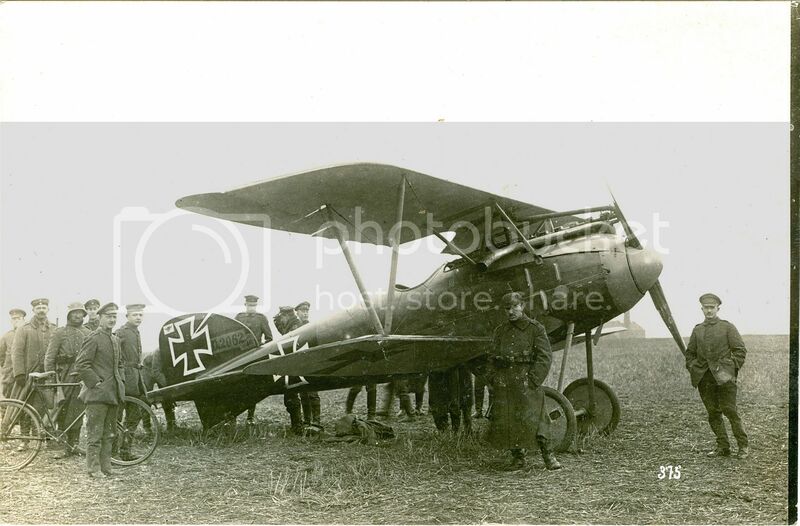 Gontermann with Albatros D.III 2249/16. It has been said this is Richthofen in a Jasta 5 machine. 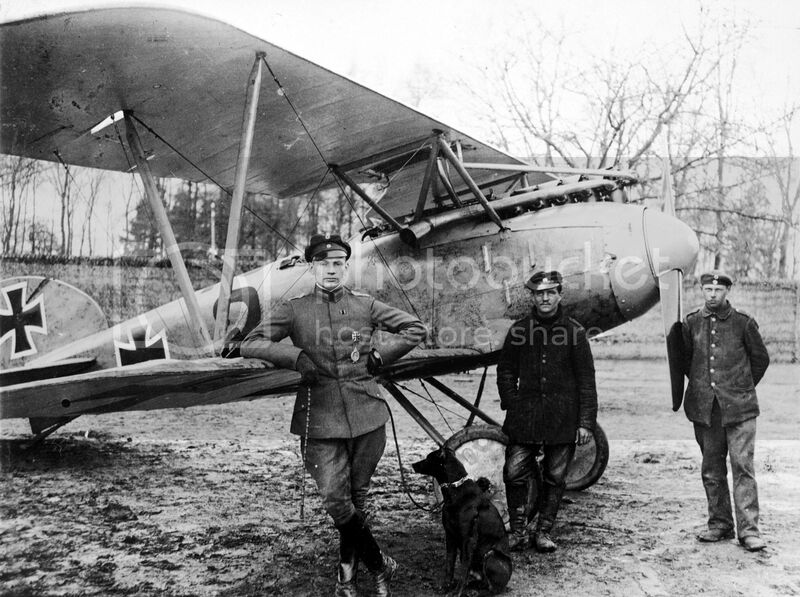 I believe it is Richthofen but I disagree it is a Jasta 5 machine. Looks to be an overpainted Jasta 4 machine to me (being used as a JG1 hack?) 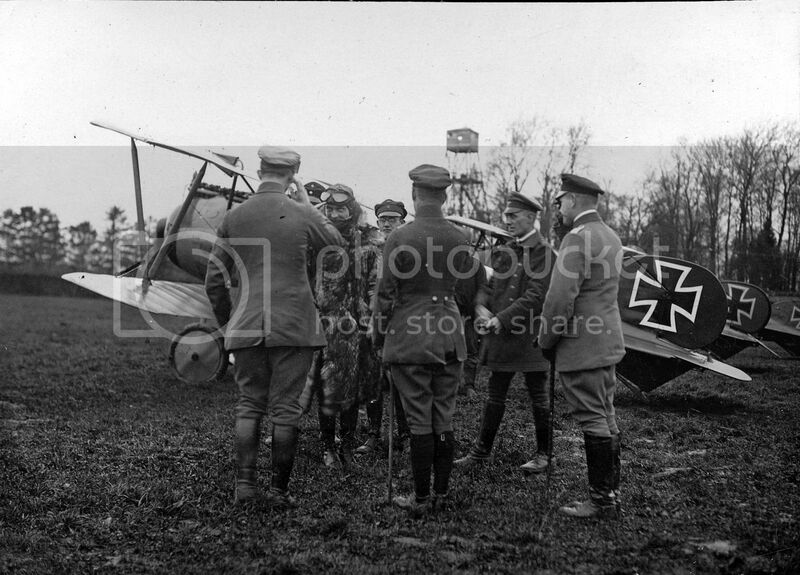 that he flew behind the lines to learn word of Lothar's downing 13 March 1918. The tail is too dark (all red?) for a Jasta 5 machine and I see no evidence of red piping. Here's Richthofen in front of the same machine. Note how dark the tail is compared to the plane next to it, which clearly does have the Jasta 5 red piping; a good comparison that shows the MvR plane was not a Jasta 5 machine. Good view of the obs tower as well. 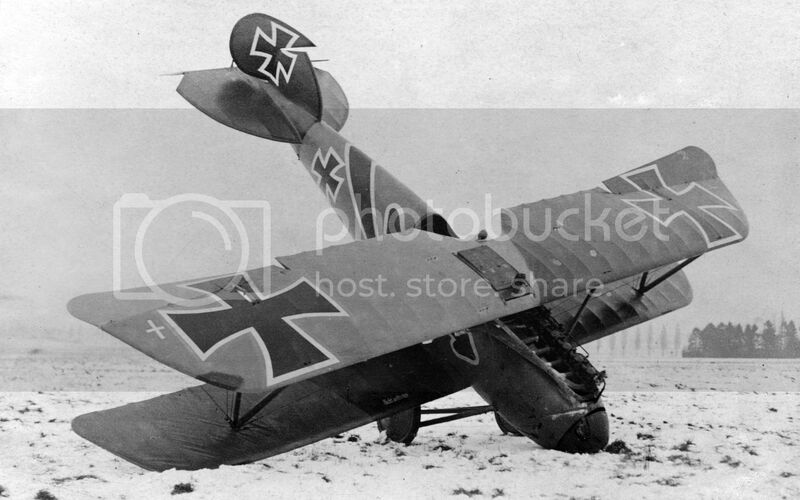 About last machine looking at thoose photos witch are of great qualety by the way, it is quite clear that the machine flown by Richthofen is indeed not a jasta 5 machine at all. I newer made this machine because had a feeling it was not jasta 5. Last edited by J5_Rumey on 22 Aug 2011, 12:28, edited 1 time in total. Good thing, Rumey. Besides, you were busy enough! Probably the busiest Staffel skinner out there! 1) Slide #78 on page 19 Volume 2. Notice that from this angle, the picture suggests that there is piping along the edge of the rudder. 2) Furthermore looking at the close up of the pictures above, I see futher suggestion of piping on the rigid forward portion of the rudder closest to the person standing there in the foreground. 3) Then notice the fact that this rudder looks in every other way exactly like the Jasta 5 rudder behind it suggesting having been painted around the same time by the same person(s). 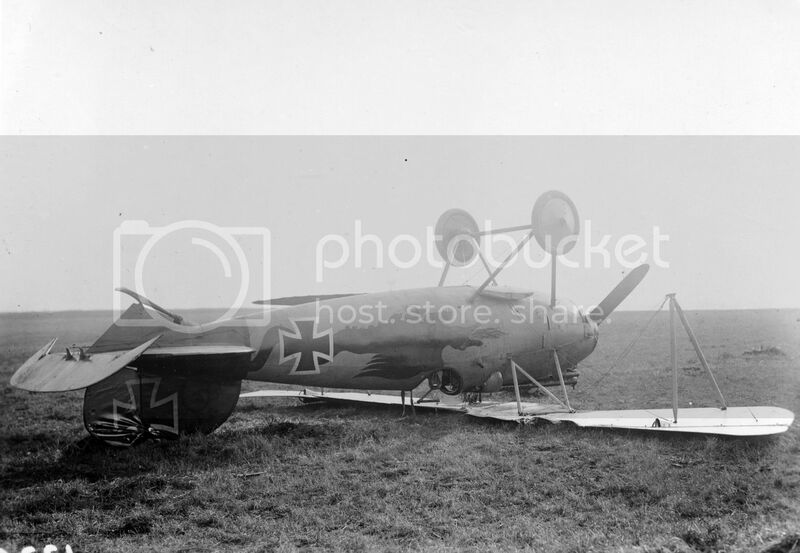 4) Not convinced, well then consider the fact that the tailplane on the machine in question appears to be turned toward the photographer instead of perpendicular like the Jasta 5 rudder next to it in the background, suggesting that shadow or shading etc could very well be at play here. 5) Finally, I recall reading somewhere that those who analyse these pictures professionally have a hard time distinguishing colors at times and shades; the nature of the photograhpy being such that shadows, shine, reflection, etc. all conspire at times against a truthful or complete replication of reality...case in point is Gürkes' own picture of the green grass of Boistrancourt, which was not that green that day, "but just turned out that way". Photos, especially black and white ones can be very deceiving. 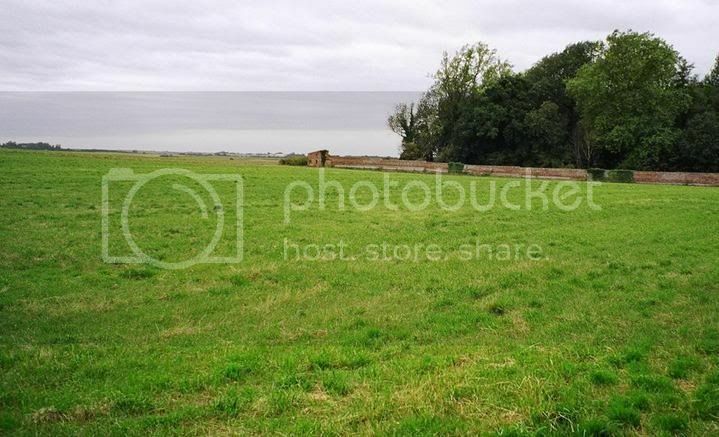 The deception (or art depending upon how one chooses to look at it) of photography still alive an well even today it seems as the "green grass of Boistrancourt" photo shows. I"ll put myself down in the "agnostic" camp on this one...it might not be a Jasta 5 machine, but based upon the additional pieces of evidence besides the one photo appearing not to show piping) there are more indications that it is more likely to actually be a J5 machine than not. (Baeumer runs for cover behind one of the dirt bulwarks in front of the hangars for cover). Well the "color" is deffently darker. So can not be a greentail. Compare it to the 2 machines behind it. the jasta 5 green tails, seems to turn out a lighter gray on photos. That beeing said not sure it is black eaither. 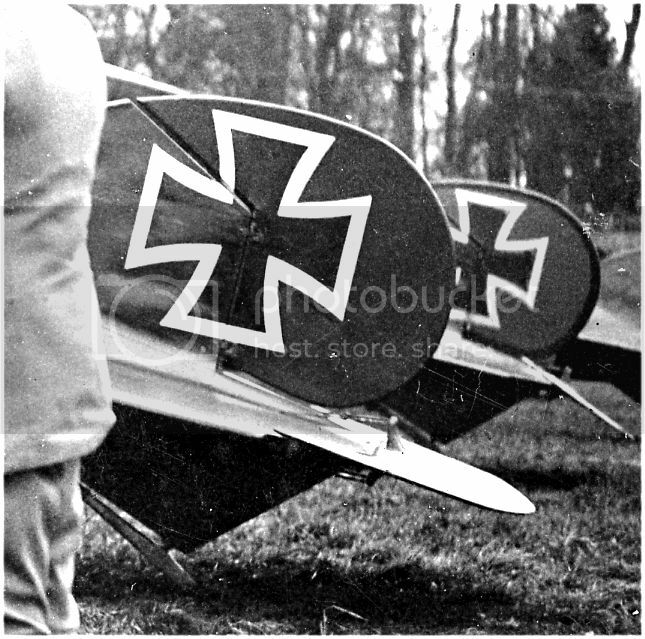 Looking at how some reds look on these old photographs and with Richthofen flying it, maybe it is a dark red? This would make sence as it matches pretty closely to the color of the pipeing on the machine behind with we know to be red. I respectfully and without malice disagree this is a Jasta 5 Albatros. Based on photographs and descriptions, this machine without question had no piping along its rudder or vert stab, it was just black, yet there appears to be "piping" on the vert stab, just like the machine in the Boistrancourt shots. 2. Beyond being overpainted D.V rudders--which look alike on countless Staffeln machines--the background D.V rudder (MvR saluting shot) is clearly and unmistakeably lighter than the MvR machine. The piping is also ostentatiously visible while on the plane in the foreground there is no piping visible at all on the darker rudder. Additional shadowing from an offset rudder wouldn't eliminate piping, it'd just make it darker. 3. 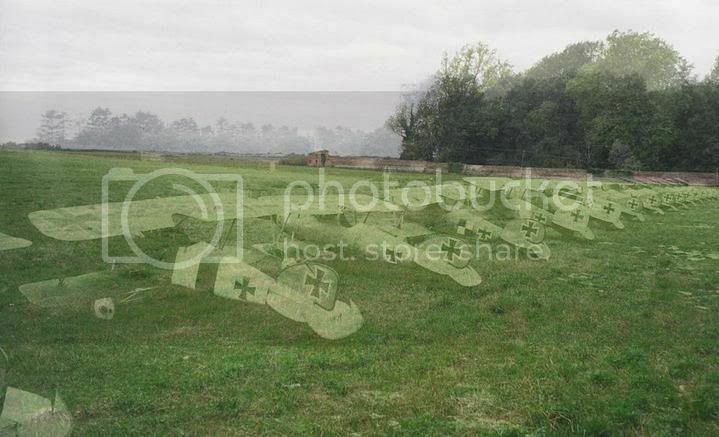 Regard the circumstances behind the photo, which research indicates was taken when MvR was searching for word of Lothar's downing 13 March 1918. My next comment is proof of nothing, but even though there is no discernible piping on the rudder or vertical stabilizer, if this is a Jasta 5 plane then MvR must have driven over and taken it from them. Why, when he has four Staffeln under his command in JG1 and could take any plane he wanted from those Staffeln? (And this plane is screaming out that it belongs to or is ex-Jasta 4.) Bodenschatz wrote MvR always did just that, grabbing the nearest machine on hand and flying off to conduct whatever business he had to conduct. 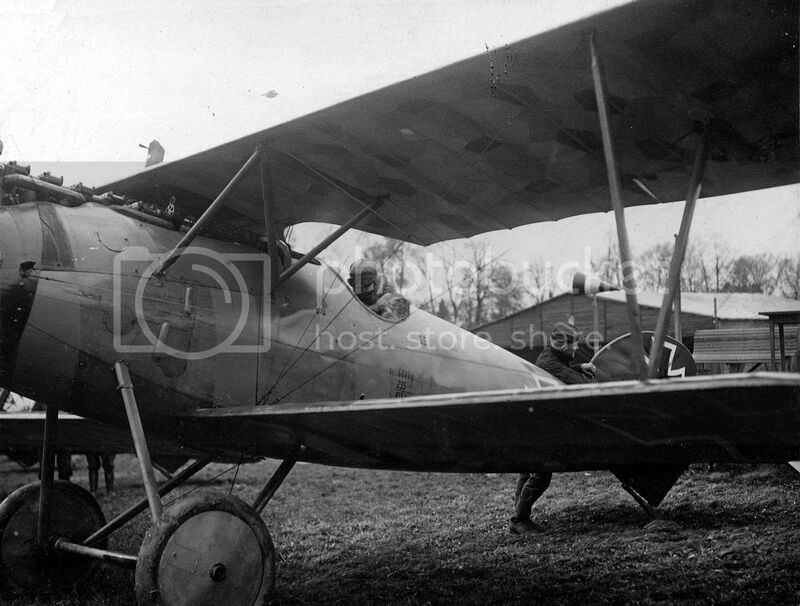 If he flew/was flown over to Boistrancourt in a two-seater (say, the JG1 hack Albatros C.IX) and then took a Jasta 5 plane, why? He would have already be flying around; why take another Jasta's plane? I concede there could be mitigating circumstances we'll never know or haven't uncovered yet, but as it stands the above makes no sense. I agree that precise determination of color values is mostly a waste of time with WW1 photography. As you wrote, "the nature of the photograhpy being such that shadows, shine, reflection, etc. all conspire at times against a truthful or complete replication of reality." I believe this is why you are perceiving red piping on the rudder when there is none. I hope I don't get thrown out of the Staffel before my first flight because of this! And if you disagree with the above, well, that's part of the fun of WW1 research, trying to figure out all of this with just "photo archeology." 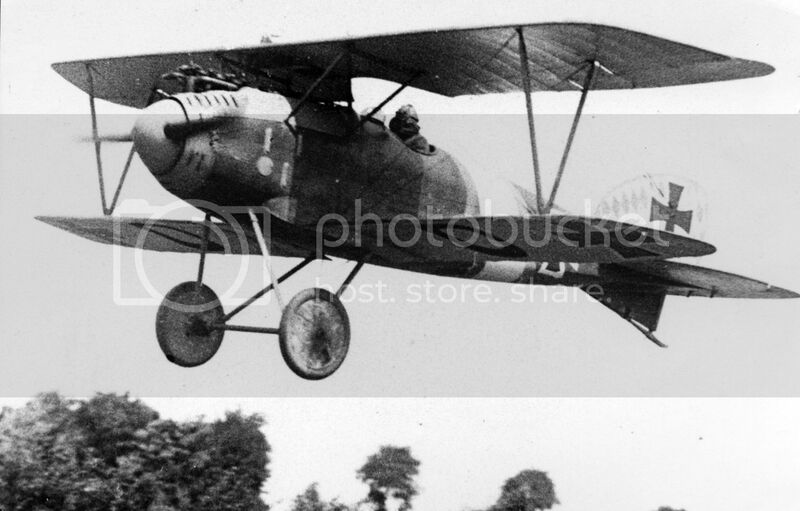 BTW, if I ever find irrefutable evidence this Albatros was a Jasta 5 machine, I'll shout that from the rooftops right after I proclaim that I was wrong. He he trown out. I love the dicussion to. But can not speak for Baumer on this. Would you agree that the tail could be red? I deffenly does not look as dark as the Ironcross. You are correct on both counts Rumey. On the second point about color, although you are correct, it may be that it only appears darker. Notice how the shading (not to be confused with color) of the tail appears somewhat different in each of the photos depending upon the perspective...? The appearance can be explained in other ways. Could it be the same color as the rudder behind it, but appear in the photo as darker for a variety of reasons. 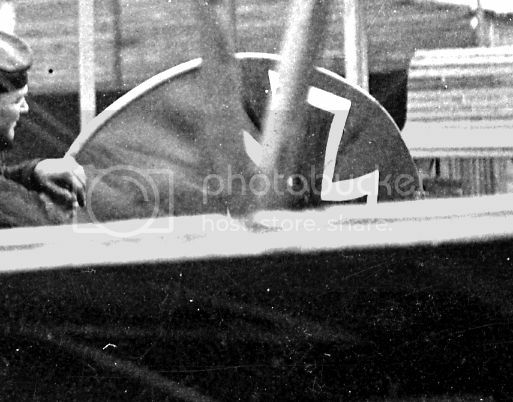 Not the least of which might be (as I already pointed out earlier) due to the fact that the rudder is turned towards the photographer? The rudders look shiny. Does the presence of the group of pilots nearby have any effect on the photo? On our eyes as we look at a very light overcoat next to the tail? In many other respect the rudder looks exactly like the other J5 rudders in the photo and J5 machines in other photos around that time. Likely the only people who can know for sure are those pilots who were there at the time. As I said, I'm agnostic on the issue as a result; definitely not the kind of thing anyone least of which I, will take any offence at; I know Gürke does not take offence! I'll come clean now and share that my thoughts shared are also based upon the fact that I hope they contribute to further developing defences for the thesis which I suspect someday may appear in a book or article which when it does, has great potential for challenging the long accepted status quo interpretations of some otherwise really respected WWI and Jasta 5 historians/authors. Just trying to do my part to contribute to that development! These kinds of discussions add to the historical aspect of our group which we like to encourage. Good news ! 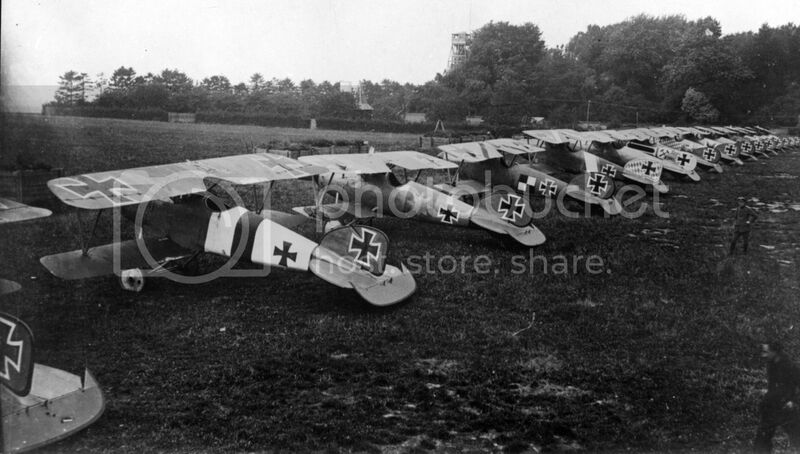 By the end of the war German paint was running out and they had to use whatever they could lay their hands on. By 1918 lozenge was not anymore what it used to be when they started applying it. Late war red and green might not have been what it had been before either. I forgot where exactly I read that. Maybe it's in one of the books our new librarian is keeping ? Fat chance they had the time and/or the urge back then to nitpick over the right colour. They were losing a war. I think you're all just whistling in the dark.